What is lake-effect snow? Hint: it involves a lake (TIME): A timely look at the science behind lake-effect snow. Brr! For the monarch butterfly, a long road back (The New York Times): Researchers at the University of Georgia are studying the human effects on migratory behavior of monarch butterflies. 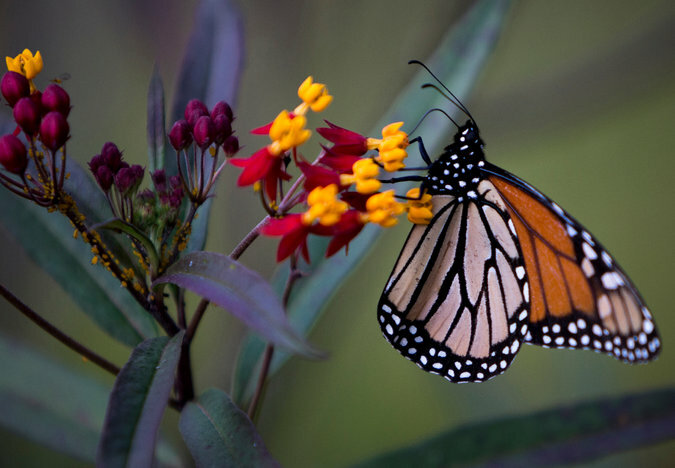 The recent efforts of amateur conservationists to replenish declines in milkweed may be part of the problem – in many cases, the milkweed available for planting is an exotic species that may lead to unseasonal breeding. Long-eared bat listing gets pushback (Great Lakes Echo): Timber industry advocates and bat conservationists are at odds over the federal protection of the northern long-eared bat. Fish and Wildlife Service officials recommended the listing and have distributed guidelines on how to best log forests without harming bats. These recommendations suggest restricted logging from April through October, which led to pushback from the forest industry. State of the Climate: Global average temperature is highest on record for October (NOAA): The combined average temperature over global land and ocean surfaces for October 2014 was the highest on record for October at 0.74 degrees Celsius above the 20th century average of 14.0 degrees Celsius. On a brisk Saturday morning, a group of intrepid young adults converged upon MNA’s Twin Waterfalls Memorial Plant Preserve in Munising to celebrate All Saint’s Day in the most hallowed of ways: volunteering in the name of community service and ecological restoration. Regional Stewardship Organizers Adrienne Bozic and John Bagley led a crew of ten in construction of a new boardwalk over a wet section of trail. Twin Waterfalls is one MNA’s most visited sanctuaries, so these improvements were much needed and will provide a better trail system and visitor experience for years to come. Our lumber was delivered, already cut to length, to the construction site at 8:30, thanks to 41 Lumber – who also extended a significant discount on all of the project materials. The enthusiastic group of students from Northern Michigan University and Grand Valley State University, all the more dedicated for having foregone Halloween festivities for this endeavor (maybe we should have had a belated costume contest? ), carried the lumber from the road up the trail to the job site. After moving all of the lumber down the trail to the construction site, we set to work clearing the area and constructing the framework for the walkway. At this point, the trail was still relatively dry. But… our work site quickly turned into a wet, muddy quagmire which would have soured most; but expectations were realistic and spirits were high. One noted that “I never expected to have warm, dry feet anyway!” Good thing! The project slowly came together over the course of the morning. Everybody took part in all tasks, including cutting, drilling, digging, and most importantly, keeping spirits and energy high. I would welcome this good-natured crew on any of my projects! David Buth of the Grand Rapids-based experiential education non-profit, Summer Journeys, brought several of his current and former students and leaders. He noted that this service project was a perfect fit for his organization’s goal to “transform adolescents through experiential learning so they become stewards of their communities and selves”. Though the Twin Waterfalls project was not officially part of his curriculum, we agree that participation in activities like MNA work days help people acquire knowledge, skills, and confidence. Working on service projects enables people to better appreciate and act ethically in the places they visit and call home. We hope to work more with Summer Journeys in the future! Four hours of heavy labor in the cold really works up an appetite, so we broke for lunch at noon to enjoy hearty and delicious sandwiches and sides generously donated by the Falling Rock Café in downtown Munising. Alas, the end of a long work day came before we could complete the project. But we got a significant portion built and a great foundation to add to in the future. Besides…we had hot pizza and cold drinks awaiting us at Main Street Pizza in Munising, who offered to donate all the pizza we could eat and then some! And we all had a long drive awaiting us: some back to Marquette, and some an all-day drive back home to Grand Rapids. What a commitment by these dedicated volunteers! You can see the keen sense of satisfaction on the faces of these well-fed volunteers at the end of a long, tough day. More improvements are yet needed, and additional segments of boardwalk have yet to be built. Keep your eye out for future opportunities to help improve this fantastic natural area! Volunteer Days will be posted on the MNA website. Thanks to all of the participants who showed up on Saturday to lend a much-needed hand; and without whom this project would not have happened: David Buth, Sky Curie, Tyler Lenderink, Peter Donnelly, Nicole Mathiasz, Kelly Radius, Nathan Sherman, Kathryn Lund Johnson, Maddie Tencate. Special thanks to the generous local business donors who made this project possible: 41 Lumber, Falling Rock Café, Main Street Pizza, the Munising Chamber of Commerce, and the Magnusson Hotel. Gov. Snyder likely to tackle energy and water issues in next term (Michigan Radio): In a post-election discussion with Michigan Radio, James Clift of the Michigan Environmental Council expects that energy will be a big issue for Gov. Snyder as federal regulations for clean energy will come into play. Snyder is also expected to unveil a water strategy in the next six months. Battlefront on wolf hunt likely to shift to court (Detroit Free Press): Voters Tuesday rejected two proposals that would have affirmed the National Resources Commission’s ability to name wolves and other animals as game eligible for hunting. This will impact a state law change last August that gives the commission that authority. The decision will likely next go before a judge. Wet weather douses forest fires (Great Lakes Echo): Michigan has had an unusually small number of wildfires this year, likely due to the an unusually large amount of rain. According to Scott Heather, assistant chief of DNR’s Forest Resources Division, this season resulted in the fewest wildfires he’d seen in his 37-year career. The largest fire the DNR responded to was about 150 acres. Typically, there is at least one fire that is 1,000 acres or more. This is a stark contrast to 2012, which saw the Duck Lake Fire spread 11 miles and burn over 21,000 acres. Keweenaw Peninsula highway makes magazine list of ‘Best Scenic Roads’ (MLive): The November 2014 issue of Country Magazine ranked the UP’s U.S. 41 among the top 10 most picturesque drives in the U.S. in a special section highlighting unique byways. MNA members who have visited one of MNA’s 15 Keweenaw Peninsula nature sanctuaries are likely very familiar with this beautiful drive.